Caught up with Amsterdam, Berlin, Prague, Vienna, Budapest, Zagreb, Ljubljana, Zurich & Luxembourg? But we've come for two days in between Zurich and Paris and we are pleased to announce that we are going to Disneyland tomorrow!! The excitement is unreal but it does mean that we have only one evening to explore Paris itself! We have been to Paris once before for my, James' birthday last year. 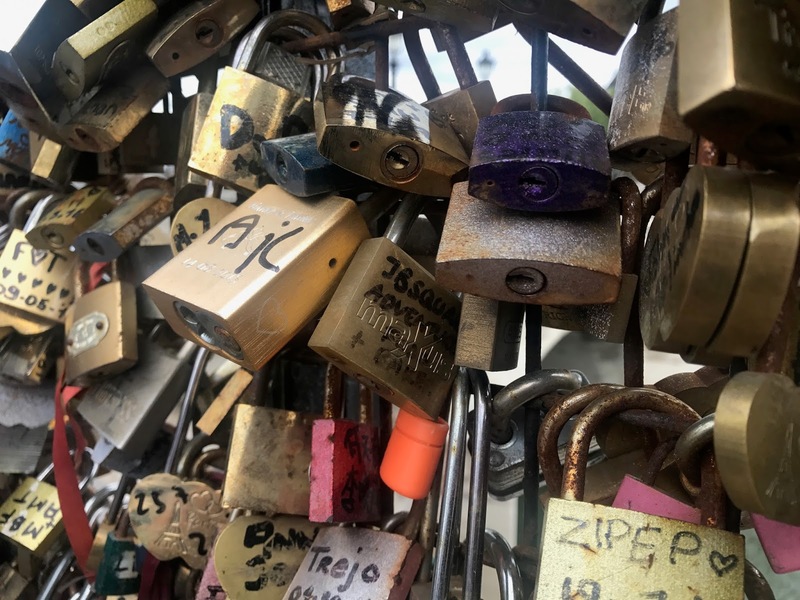 We locked a love lock on the Pont des Arts, the bridge most famous for this kind of thing - there must be thousands of locks on this one bridge! We made our first mission to go back and find it and miraculously we did! 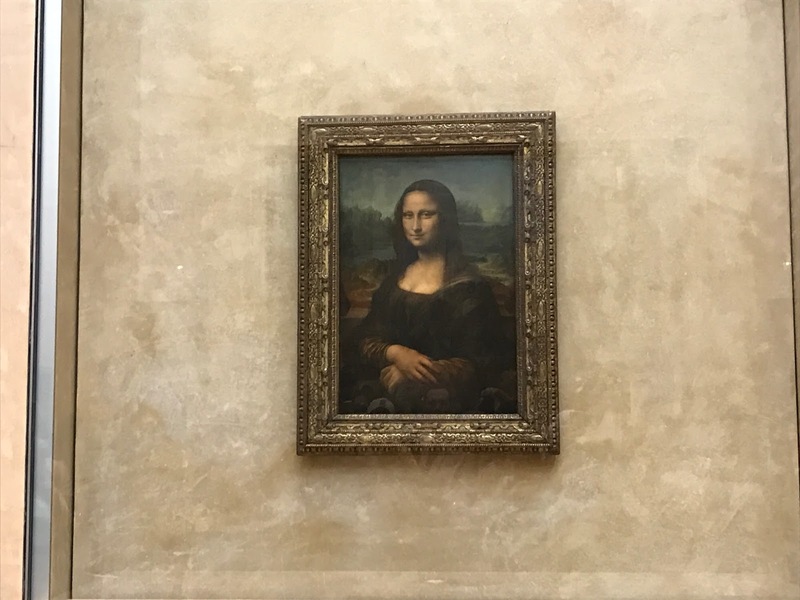 From there we took the short walk over to Musee de Louvre - the largest museum in the world and home to many great art pieces including the one and only Mona Lisa. We were very happy to find out that here along with many other national monuments are free for 18-25 year olds, so we took the opportunity to go in! We're not going to lie, we came for one thing and one thing only, and especially with time being of the essence, we didn't stop to look at much else other than the one painting. Crowds were swarming to get a glimpse around the Mona Lisa, some even trying to get selfies with it for some reason, but after doing exactly the same ourselves, we moved on. Our final stop of the day was the Arc de Triomphe, and as it was getting past sunset by this time, we would be up there to see the glistening Eiffel Tower on the hour of 10pm. The tower glistens for 5 minutes on the hour, every hour past dark. After making our way up many flights of stairs, we finally made it to the top which gave breathtaking views of the entire city. But of course, 90% of people were shrouded in one corner, to see the tower. From here we made our way back to our AirBnb as we needed some very good sleep. We have an incredibly exciting but long day ahead tomorrow as we're off to Disneyland! You don't need me to tell you to come back tomorrow for that blog post! Love the pictures! I'm going to Paris with my boyfriend for my 22nd birthday in September! Very excited! How exciting for you! You'll love it! It's been so good, even if it was a flying visit! We're so happy to have found our love lock! Thanks! Paris is great, you'd love it! Yessss! This is our second time and we still feel like there's more to see! It's great isn't it? We hope to see more again one day! I have always wanted to go to Paris!! My best friend went at the start of this summer and absolutely loved it! I think he spent a whole day in the Louvre as there was so much to see, and knowing me and my history obsession, I would probably have done the same! How stunning are those views of the city from the tower?! I'm so jealous! I think your photos captured the city beautifully! Thanks for sharing your unexpected Parisian adventures! You should definitely visit Paris! So true, you'd absolutely love their history, museums and landmarks! Paris was a great spontaneous spot! Paris is one of my favourite cities, I could go back time and time again! Thank you so much, it was my fave dress on our hols! Paris is such a great city, our second time now! I absolutely love your pictures in this post, and your dress Jessica! Paris is very high up on my bucket list, so hopefully I get to go there soon! It's wonderful that there's so many things for free for 18-25 year olds, I will definitely bare that in mind if I ever do visit! Thank you so much, you're so kind! I know, it's such a great thing that they're doing for 18-25 year olds! Saves some pennies too! It amazing that we didn't know you could go up it, so glad we did! Aw loving your unexpected Pairs detour. Jessica you look so lovely in that dress! I really want to go back to Paris and explore its history and culture properly - it seems so rich and vibrant from your post! It was the best decision! Thank you so much! There's so much to see when with our second visit!